Hundreds of thousands of Europeans may face premature death in the next two decades because of toxic air, a new major report by the European Environment Agency (EEA) has warned. In 2011 alone, about 430,000 people died prematurely from air pollution. A five-yearly environmental study, State of the Environment Report for 2015, blames governments for inaction and has called for changes in policies and technologies and lifestyles. The European Union will need new, radical policies to safeguard the environment by 2050, experts say. "We need to start now," Hans Bruyninckx, head of the EEA, told Reuters. The Copenhagen-based EEA said that Europe has increased waste recycling and cut greenhouse gas emissions by 19 percent since 1990. 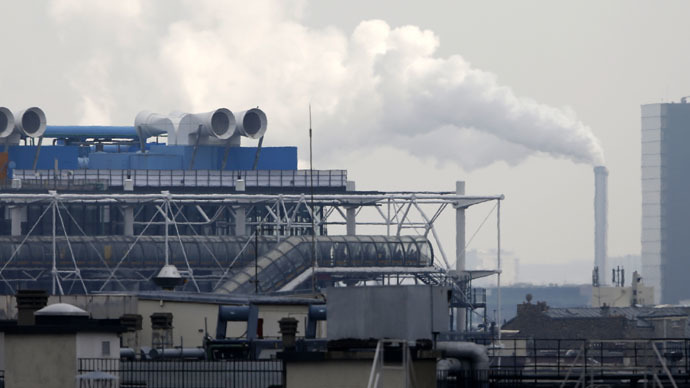 The EU plans a further emissions cut of 40 percent by 2030. Despite these gains, however, Europe “still faces a range of persistent and growing environmental challenges," including global warming, chemical pollution and extinctions of species of animals and plants, the report informed. “Despite considerable progress in reducing the discharge of pollutants into Europe's waters in recent decades, nutrients, pesticides, industrial chemicals and household chemicals continue to affect the quality of surface, ground and marine waters. This threatens aquatic ecosystems and raises concern about potential human health impacts,” it stated. Air pollution causes damage to human health through direct exposure (via inhalation) or through exposure to contaminants transported through the air, deposited on plants and the soil. Vehicles, power plants, agriculture and households all contribute to Europe's air pollution, the report’s authors stated, adding that transport remains the main contributor to poor air quality levels in cities and related health impacts. Exposure to environmental noise is estimated to contribute to at least 10,000 premature deaths due to coronary heart disease and strokes each year. Chemicals from pharmaceuticals, personal care products, and other consumer products can have a range of negative effects on the environment and on human health. Endocrine disruption, which impacts the body's hormonal system, is of particular concern, according to the study, which points out that potential human health impacts of these chemicals are “poorly understood,” especially when people are exposed to mixtures of chemicals, or when exposure occurs in pregnant women and small children. Europe will scarcely manage to realize its target of "living well, within the limits of our planet" by 2050, according to the report, given that most Europeans have been using more than four hectares of the planet's resources each year - more than double what it rated a sustainable ecological footprint. The European Commission has estimated that a shift to a greener, low-carbon economy by 2050 will require investments of an extra €270 billion a year, or 1.5 percent of EU gross domestic product (GDP) in coming decades. The EEA said Europe could benefit economically from greener cities, industry, transport and agriculture. "This is not a threat to well-being ... For Europe this is a major opportunity," Bruyninckx said, adding that 2050 green goals are closer than we think, given that Europeans born today will be 35 in 2050, with more than half their expected lifetimes ahead of them. According to the report, EU citizens live longer than in many other parts of the world. Life expectancy at birth in the EU-28 member states exceeded 80 years in 2012, and is higher for women. The gap between the lowest life expectancy in the EU (68.4 years for men in Lithuania) and the highest (85.5 years for women in Spain) is considerable, however. The share of the older population in all the member states has been increasing in recent years. The current proportion of people aged 65 years and over, already exceeds 17.5 percent and is projected to reach 29.5 percent by 2060, according to Eurostat.